The Presidential Scholarship is the most prestigious scholarship available to new freshmen. It is awarded to academically-talented students who have demonstrated a commitment to academic excellence and extensive extracurricular/community involvement. 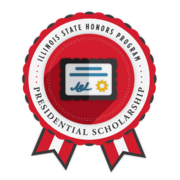 This four-year scholarship is awarded by the Illinois State University Office of Admissions. Congratulations! This badge recognizes your achievement in being named a Presidential Scholar by the Illinois State University Office of Admissions.